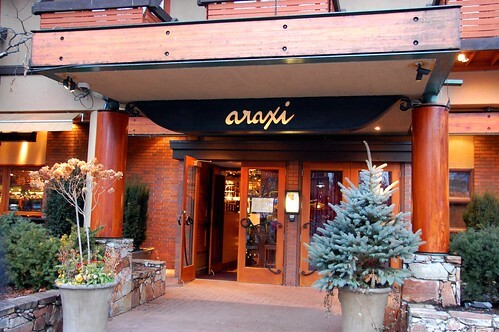 If you visit Whistler, head to Araxi for a meal to remember. Hell's Kitchen viewers may recall that this was the ultimate destination of Season 6 winner, one-armed Dave. You know your dinner is going to be good when your butter looks like this. 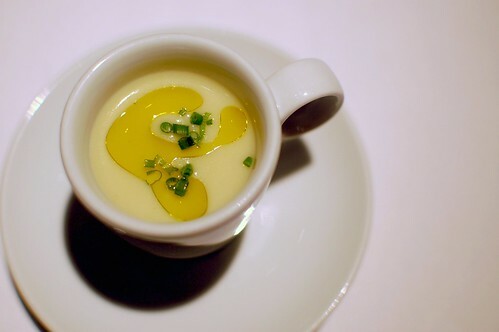 A tasty amuse bouche of cauliflower soup doesn't hurt either. 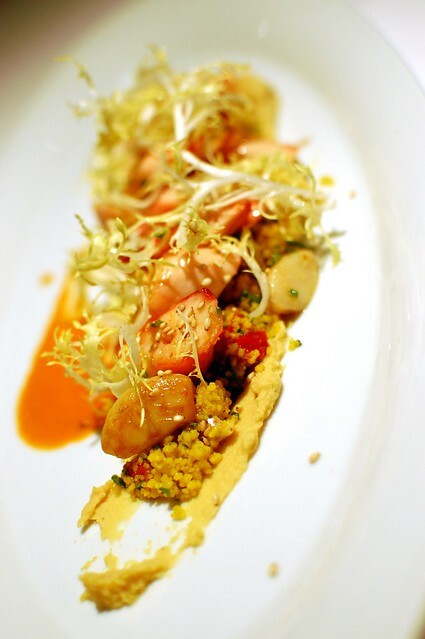 Vancouver Island octopus with spiced couscous, sundried tomato, harissa vinaigrette, chickpea and roasted garlic puree (CAN $15.50). Tender and delicate with just enough chew. Fabulous. 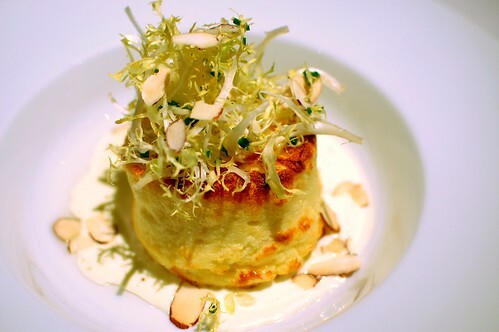 Moonstruck White Grace Souffle, toasted almonds, chives and baby frisee, bay laurel, and Parmesan cream (CAN $17.50). A creamy, cheesy, close-your-eyes-and-say-mmm moment. 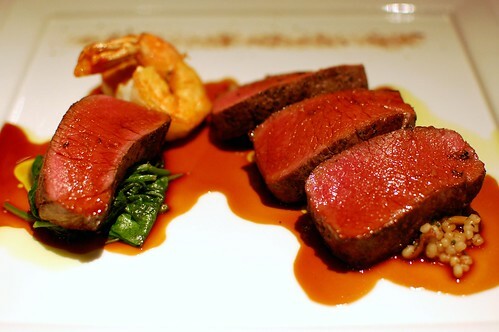 Roasted loin of venison, caramelized onion and braised venison barley, sauteed baby spinach, porcini salt, and spiced venison jus (CAN $35.50) + Qualicum Beach scallop (CAN $6.00) + Pacific prawn (CAN $3.00). We came. We saw. We conquered...this venison. This was the best venison we'd ever had in our lives. Our lives, people. That good. Mr. Monkey was in a greedy mood and made his own surf-and-turf plate by adding a scallop and a prawn to this dear deer. Rich. Succulent. Epic. 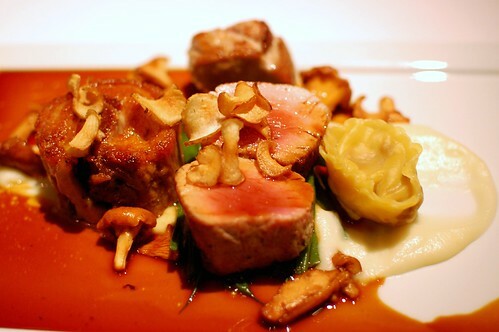 Paradise Valley pork selection, three cuts -- three ways with Pemberton sunchoke puree, baby green beans, and chanterelles (CAN $29.50). This little piggy had piggy cubed. Triple the flavor. Triple the fun. Triple the joy. 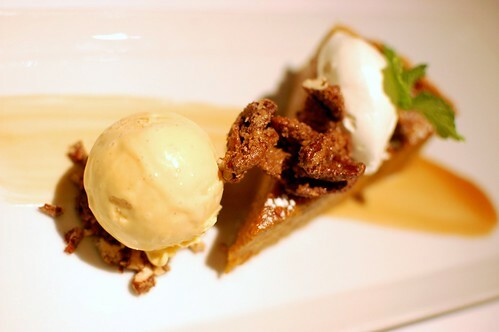 Sugar pumpkin tart, toasted spiced pecans, vanilla and roasted apricot ice cream, rosemary, and caramel sauce (CAN $11.50). Just looking at this wondrous dessert makes me want to weep. This was so exquisite, my friends. The pumpkin. The pecans. The caramel. 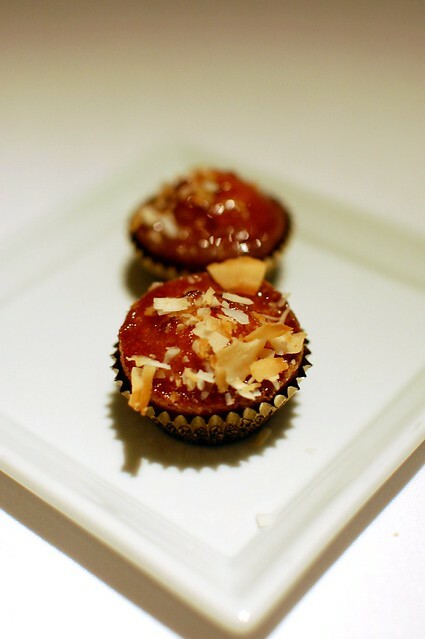 The roasted apricot. Oh, yeah. Two final sweet nutty glazed bites to send us off. Fantastic meal with superb service and the most amazing venison in the world. beautiful space and beautiful food. It all looks so good. Too funny. As I was reading the first sentence I was wondering if it was the Hell's Kitchen restaurant. Glad you had a better experience there than we did! Pictures look great! Nom nom nom, I want that mignardise. 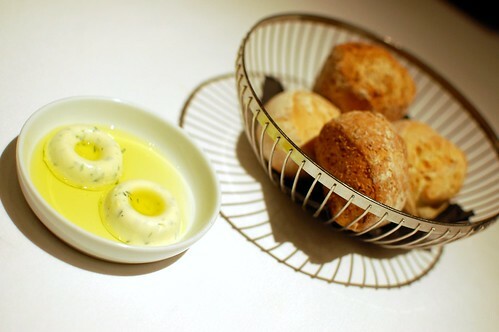 I love your luck w/ great looking butter presentation too. 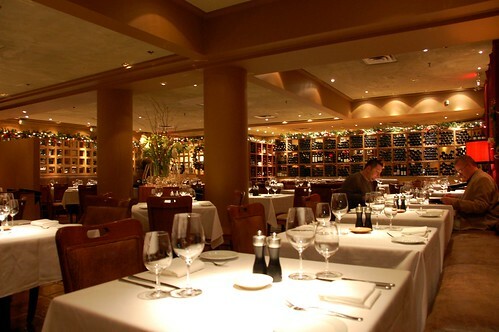 Nice to hear about the Hells Kitchen restaurant! The butter alone looks phenomenal. In the unlikely chance that I'll be in vancouver, I'll go! Yum. Wish we'd made it to Whistler. those meat photos are incredible. i want to lick my screen.